December 15, 2010 August 26, 2014 / Julie Brook, Esq. 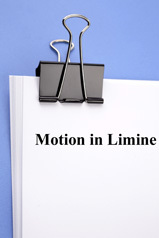 Have you heard about in limine motions, but are not sure what they are and when to use them? Put simply, an in limine motion is a request made before trial begins to admit or exclude evidence before the evidence is offered, and thus seen by the jury. Most often they are used to keep out evidence that might be prejudicial if offered or discussed in front of the jury—once the evidence gets before the jury you won’t be able to unring that bell. Failing to meet and confer before filing the motion. A motion in limine is subject to the rules applicable to motions generally, including the requirement that counsel meet and confer. See CD Cal Local Civ R 7-3; Los Angeles Ct R 8.92(a)(2). Filing a motion in limine to exclude evidence that is clearly inadmissible and can be dealt with quickly if the attempt is made to offer it. Using a motion in limine as a substitute for a summary judgment. Although a motion in limine may have the effect of foreclosing critical issues and thus dictating a result, it cannot be a substitute for a summary judgment or a subtle effort to reconsider such a motion. See, e.g., Los Angeles Ct R 8.92(b). Motions for summary judgment are subject to very specific rules. See Fed R Civ P 56; CCP §437c. Using a motion in limine to raise discovery issues that should have been raised before the discovery or motion cut-off. A motion in limine deals with the admission of evidence—it is not a late-filed motion to compel discovery. When you make a motion in limine, you give the judge a chance to derive the benefit of your extensive research and analysis. Even if the judge doesn’t rule on the issue before trial, he or she has been sensitized to it and will be listening to the trial with the issue in the back of his or her mind. Thus, if the issue does arise during the trial, the judge will be prepared to make a well-reasoned ruling that is likely to withstand appellate review. There is no statutorily-required form for in limine motions, but local rules may require them to be written and may prescribe the format and contents. See, e.g., San Francisco Ct R 6.1; Los Angeles Ct R 8.92. If you make the motion orally, be sure to have the court reporter present. But, it’s much better to make a written motion in limine. If a motion in limine is successful and the court agrees to exclude the evidence, the excluded evidence may neither be introduced nor be referred to at trial (including in an opening statement). Keep your eye on the opposing side to make sure he or she does not violate the exclusion order, which could result in a mistrial (see Evid C §353) or a contempt citation. If you are unsuccessful in your efforts to exclude evidence, be sure that the motion and the court’s ruling (including grounds for it) are made on the record, or put on the record, to preserve your objection for appeal. 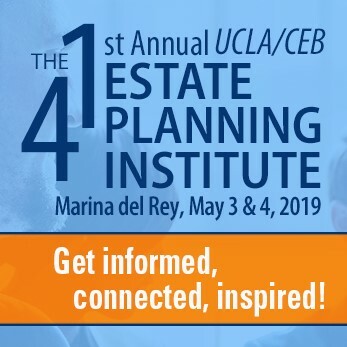 For everything you need to know about motions in limine, go to California Trial Practice: Civil Procedure During Trial, chap 7 and California Trial Objections, chap 2. Check out CEBblog™ posts on evidence topics here.